It was thanks to Pyrker János archbishop of Eger to educate teachers in Hungarian language, it was him who established the first Hungarian language teacher training school in 1828. The most valuable, the grandest monument of Eger, basicly dominating the town view. One of the oldest higher education institutions of the country. Our folkart is a spiritual cultural heritage, a community knowledge generated and carried on from generations to generations. Three major carst spring outburst places can be found int he area of Petőfi square. The water composition values of the healing springs of Eger are invaluable. The written sources of the past of Eger and Heves county are indispensible for those dealing with history science, local and personal history. The local knowledge collection of the library tries to fulfil the interest in the past, present and future of Eger and our county. National value, its look and elegance is unique. The local inhabitants love it and respect it since thanks to their votes it was elected to be the Tree of Hungary in 2012 and the next year the Tree of Europe. The waterworks-machine house in Petőfi square and de-acidizer in Petőfi square and the 2 x 300 m3 drinking water reservoir on Hajdú hill have been the basic establishments of the drinking water supply of Eger town since 1927. The castle of Eger as a historical memorial site represents a cultural heritage inseparably connected to which are such values like the burial site of king Imre I. and the patriotism and heroic bravery of the defenders in 1552. The most outstanding red wine of Eger Wine Region and of all Hungary is an accentuated National Value and since 2017 it has been a Hungaricum. Egri Csillag wine (Star of Eger)”. This white wine of Eger Wine Region having become a dominant player by now may become a real Hungaricum the production of which cannot be repeated anywhere else in the world. Archbishop’s Garden is one of the oldest still existing Hungarian parks, as a historical garden it is locally protected. Also called as „the lungs” of the town. Protected cemetery garden of local importance. It is important to preserve the existing original look, natural values of the cemetery for the future. The district mastership of Eger nowadays has uniquely preserved the heritance of the several century tradition from generation to generation in Hungary. The bells of Eger are relics of religious- and industrial history. The fiery wheel of Eger is an iconic relic of the victory in Eger in 1552. The underground corridor – casemates - system of Eger castle is unique in the country both in its historic importance and its technical solutions and size. It makes Eger and the defence of the castle in 1552 popular and well-known through its connections all over the country and Europe. Kopcsik Marcipánia is an attraction of Eger which is a unique collection of works of art from marcipan all over the world. Wine culture and gastronomy connected to it and of course the biggest wine cellar area with its natural values are of outstanding touristic attractions of Szépasszony-valley. Minaret of Eger with its great carved tower and stone decorations is a representative of Muslim-Turkish architecture in Hungary. Civil Forum cooperation system of the civil organisations of Eger Town, the parliament of the communities of the inhabitants of Eger. It is a unique example of cooperation of the civil organisations of the town with its continuous work. The puppet theatre has had numerous successful performances in several countries with the little puppets making Hungarian culture popular. The trees, groups of trees, trees of alleys representing outstanding dendrological and aesthetic value are important to protect for the future. Outstanding sportsmen of not only local but of national and world level have started from Eger in the past 100 years. The second largest church of Hungary, the impressing look of which is emphasized by its position as well, an outstanding creation of Classist art. The oldest building unit of Hungary built as a hospital of contemporary professional standards, had its own pharmacy and has been used for medical purposes since then. Little Provost Palace, Kossuth str 4. Grand Provost Palace, Kossuth str 16. /at present the building of Bródy Sándor County and Town Library/. County Hall with the late Baroque wrought iron gates of Henrik Fazola and the building of the old prison, Kossuth str 9. The locally protected nature reserve is home of several botanical, zoological, geomorphological and culture-historical values. Thanks to the competition since 1992 the floral surfaces have got multiplied in the town and the conscious environment decoration activity of the inhabitants has also immencely developed. An outstanding creation of European Baroque with its architectural, fine- and applied arts values. One of the nicest Baroque churches of Central Europe is situated on the main square of Eger. It is a Baroque, late Baroque monument of Eger, some of its enterior (altar pictures, pulpit, etc.) date back to the 18th century. The crosses, Madonna statues represent important religious historical and town historical values. The two-towered church with straight-cut apsis having a cript is one of the largest ones in its size and art-historical values. The botanical garden has about 400 plant species – this way it is a genetical information about the flora of Hungary and of the Carpathian Basin. The building unit represents outstanding monumental value, it was created by outstanding artists. The town is well-supplied with works of art placed at the public places of Eger. Outstanding works of artists have been hosted by the town. The building unit is one of the nicest and most valuable architectural relics of the downtown with several internal architectural details, Baroque and late Baroque stoves, frescoes from the 18th century. A historic and tribute memorial place of Eger. Respecting and preserving the memory of the heroes resting in the cemetery is the task of posterity. The music school has become a dominant factor in the cultural life of the town. The students, teachers of the music school are permanent participants of the town- and county programmes, celebrations. The herb destillation „invented” by the head of the Jesuit pharmacy in the middle of the 18th century is one of the most peculiar memories of the past of the pharmacy of Eger. The relic painted in 1500 is a rarety not only in Eger but in Hungary as well. A bridal case used to be an important piece of furniture of grapegrowers’-, winemakers’-, craftsmen’s, relailers’ households of the outskirts of the town. The layers of the clay quarry excavated at the time of the operation of the factory revealed an internationally unique, exceptional geological-paleontological heritage. It is one of the most complete collections having survived intact. The writer gained high rank in Hungarian literature history with his life work. When bishop Eszterházy Károly continued the university founding plans of his predecessor Barkóczy Ferenc, his first duty – after having completed the Lyceum – was to create a library worthwhile for a university. Bródy Sándor is a dominant personality of the literature of Eger whose art has made important inprint on the town. Nowadays writer, poet Apor Elemér is the one who proves the words of Gárdonyi: not everyone can be born in Eger, but can gain it to be called local citizen. .
His paintings made all over the archdiocese make it a life work one of the most important of the 18th century fine arts of Hungary. It has worked as a state grammar school since 1890 in one of the nicest Baroque buildings of Eger. It was built by the Jesuits to be a grammar school and a monastery in 1754. When the order was banned in 1773, it was given over to the Cistercians and from 1787 it worked as a royal grammar school. The creation, construction of the railway sub-line in 1872 fundamentally changed the public transport conditions of Eger. Citizens of Eger and Felnémet are very proud of his work. His art reveals landscapes of Heves region, the cosy beauty of Baroque Eger, portraits of local people in the past, faith in family. 9th February 1850 is commemorated by the Hungarian nation, as it was the day when Lenkey János general died in Arad in the castle prison. 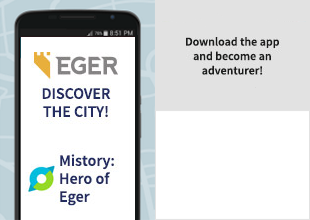 Eger is proud of him born in the town for his heroic deeds and perseverance for his homeland, nation. Hartl Ede living in Eger rescued the belongings of the inhabitants of Tiszahalász and Sarud. He set an example not only with his support during the flood of 1876, but also with his generous patronage. He was an open-minded, well educated, widely respected person interested in a numerous things. His great knowledge was combined with exceptional modesty. He lived and worked for his town, Eger. The townhall of Eger is the venue of public life, a dominant building unit in István Dobó square. The assemblies are public, can be followed in the programmes of the town television, an the inhabitants of the town are continuously informed about the activity going on in the town. The main hall – the central part of the building – is a space suitable to welcome guests, to arrange the assemblies, a place where cultural and other events of crucial importance in the life of the town are organised. The hóstya-districts of Eger are peculiarities in the settlement construction of our town having been formed in the 18th century when new people doing peasant- and crafts activity settled besides the citizenhood already living in the town centre. The majority of Eger lived in these parts of the town for centuries providing not only the inhabitants of the city centre but the settlements of the region as well with agricultural products, manufactured goods. Mihály Kovács is an important representative of Hungarian Fine Arts of the beginning of the 19th century. His artistic heritage is not only local value but it is in national and European standards as well. An apple variety re-discovered as a land variety involved in mass production as well. The chapel of Virgin Mary cemetery is an early 18th century building which got its present facade in the 19th century, this way Classicistic elements can also be discovered on it.